Wow I haven't been here in ages, feels awesome to be back. I've been having this annoying issue for probably a year now, but I can't for the life of me find any solution anywhere and it's not from a lack of trying. I use MPC for everything (mainly because VLC can't skip to the next file in a folder and I hate queueing files), but for some reason if I play a game while watching something (yes, I do this... lol), after a while MPC starts getting this weird launch stutter. Well, I say it's MPC, but when I skip to the next file it's more like my entire PC stops responding for like 5 seconds before the file starts playing. This literally only happens when I play a game while watching something. If I don't play a game while watching a video, it never happens. It also doesn't stop happening after I quit the game, the only thing that fixes it is rebooting. I've reinstalled K-Lite from scratch, updated to the latest version, reinstalled and updated graphics drivers, motherboard drivers, audio drivers, heck I've even reinstalled Windows. Nothing makes any difference. On a side note, I've got dual monitors, one 1600x900 and one 1280x1024. Obvious if I'm watching stuff while playing a game I guess. I'm at a loss here, no idea wtf could be the problem. You can tell VLC to play multiple files of your choice. Maybe you are running out of VRAM. Try monitoring your VRAM usage. I think I'm going to switch to VLC and get it over with, even if it's less convenient. At least it's not giving me this weird issue. I don't think it's that, I'd be playing an old game like Oblivion while watching a 720p anime clip, then it will work fine for 3 or 4 videos and then when I skip to the next one my whole PC locks up for about 5 seconds. There's no in-game stutter or video playback stutter when the initial lag is gone, so I don't think it's my 2GB VRAM running out. I could do the same with the 768MB GTX460 I had before and I never had this. But with that card I was running Windows 7. It also doesn't happen with VLC at all if I added a bunch of files to the playlist and just let it play. With MPC it does it regardless of whether I skip to the next file in the folder or if I use the playlist. I think it's got something to do with K-Lite and Windows 10. Or maybe even MPC and Windows 10. I haven't used kite in ages. VLC has all kodecs built in and personally, I think it runs better. Codecs. And no it doesnt, but they make it super easy to get more. I've been using MPC-HC (now MPC-BE) for years and never installed codec packs. What codecs are needed on it? Not sure, I usually just install k-lite because it comes with MPC and pretty much every codec I've ever needed. Does MPC-HC come with x265 support out of the box? Video quality has changed over the years, and so has the way PC hardware handles them. If you were watching old videos that just used the CPU for rendering, that is going to give you a different experience than a video and game running off a single GPU at one time. True, but it still doesn't explain why I get artifacts and messed up video in VLC when I don't get it in the same video on MPC. and on the other hand, VLC doesn't have the launch lag that MPC has after I've been playing a game for a while. this is either a Windows 10 issue, or a recent codec issue. But my money is on Windows 10 since I had none of these issues on Windows 7 and I've been using GPU rendering for video since I got my first DX10 card years ago. One thing that causes launch lag for some people is the new "focus assist" feature of Windows 10. You can disable that in the modern settings app. To disable it completely you need to deactivate its main option, as well as the automatic rules below it. Another suggestion would be to disable hardware acceleration in the video decoder. VLC also has options for that buried in its settings. If you use Madvr, then try disabling D3D11 in its settings. I saw some reports of issues while gaming (or rather multiple apps that use D3D11 simultaneously). Although, that was with black screens instead of lag. All these issues is mostly fault of Windows 10 changing things every few months, and party fault of drivers. As a reply to coffeemonster, the benefit of K-Lite is not really extra codecs. It contains much less stuff than most people think. It uses the same codecs (LAV Filters) as standalone MPC-HC. But it also contains some very useful extras, such as Madvr (high quality video renderer) and Icaros (for thumbnails). It also has a much more advanced installer that offers a lot of configuration options. For example hardware acceleration, preferred languages for audio/subs. Plus it actually properly creates file associations. Thanks for the detailed reply, I didn't know that about K-Lite myself and I've been using it for years! Never really bothered to check I suppose. I'm going to try some of your suggestions and post my results. I believe AMD GPUs had a bug where it gets stuck at low GPU frequency, used for video playback, when playing videos and playing games at the same time. I'm actually not sure, most of my videos these days are x265, but I'll look into the GPU frequency while playing and see what happens. My drivers are the latest though and the RX560 has been out for a while so I don't think there should be such a bug? I'll test with x264 and see what happens too. That is going to make a difference. More compression equals more work for the GPU. Let us know what x264 video does. Edit: The only way to fix this seems to be a hard reboot. I have however had it fix itself at random though. I checked video memory, but seeing as I was only playing Age of Empires 2 HD that wasn't an issue at all. And it persists even if I close every app and launch a new instance of MPC. Does it work correctly again after closing everything, without a new MPC instance? And if you launch MPC through its own shortcut (so without playing anything)? Does right-click also not work? If you google for "windows 10 mouse click not working" then you'll find lots of weird mouse issues with potential solutions to try. For example restarting explorer.exe, disabling Cortana, different USB port, and creating a fresh user account. Are you using madVR? 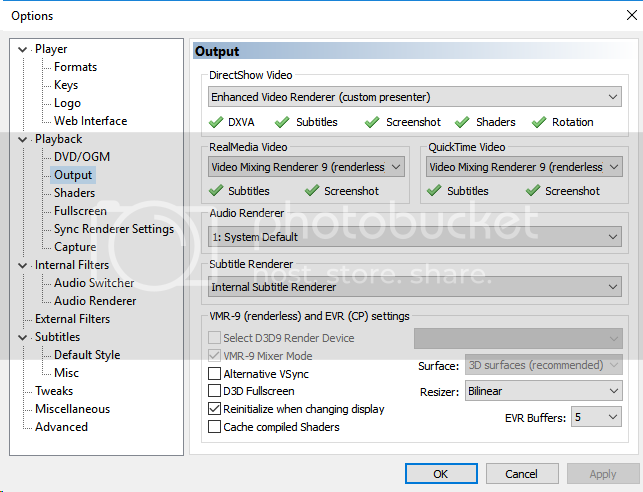 If you are try using enhanced video renderer (custom preset), located in view>options>playback>output, just to make sure it isn't madVR. Nothing works properly unless I reboot. With or without a new MPC instance, it makes no difference. Opening MPC by itself doesn't have any issues, only when I actually load a file to play, then it will lag for about 5 seconds before it starts. I can fix the click issue by logging off and back on, but that doesn't fix the lag problem either. Edit: None of the mouse buttons work if I click, it's like the UI is focused on something I can't see, although the title bar isn't greyed out like it is when the UI is focused on another window. I've tried a LOT of the fixes online but nothing made a difference. I've even reinstalled Windows, so creating a different user account doesn't really factor in either. I'll check for the mouse click thing and see if someone might have a similar problem. I have exactly the same problem with Windows Media Player, so it's not MPC that's the problem. To me it looks like there's something in K-Lite that doesn't like fullscreen 3D applications running alongside a video. Have you tried disabling hardware acceleration in LAV Video? WMP by default uses the standard Media Foundation codecs from Windows itself. If the problem is truly video playback related, it is not the codecs that are at fault but the driver. Thanks, I'm going to try that. I haven't been watching & gaming much the last few days, so I haven't had the issue for a while. I'll report if it makes a difference. Thanks, but this isn't the issue I encounter. My games run smooth, no matter if I play Age of Empires 2 HD or Fallout 4. The only time I notice this stutter is when I launch a new video file through WMP or MPC, or when I skip to the next video in the playlist. Once the video starts playing, there's no stutter in the video or in the game.